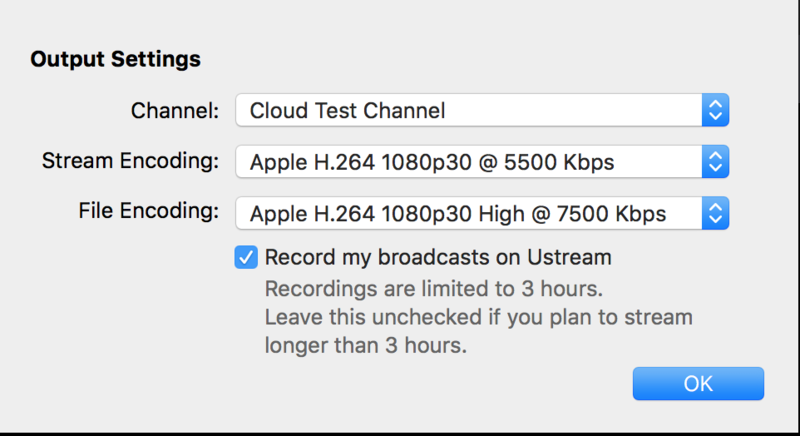 There are 5 different methods of saving a recording of your broadcast onto your channel. Which one you use will depend on what encoder you are using. With our Web Broadcaster you can easily record a live broadcast, or record a video without broadcasting, by clicking on the "Start Record" button at the bottom right of the window. Fill out the prompted information (all fields are required) and click "Save"
You will now be able to find your recorded video in your channel by going to Dashboard -> Channel -> Videos, where you can access all our video functionalities. 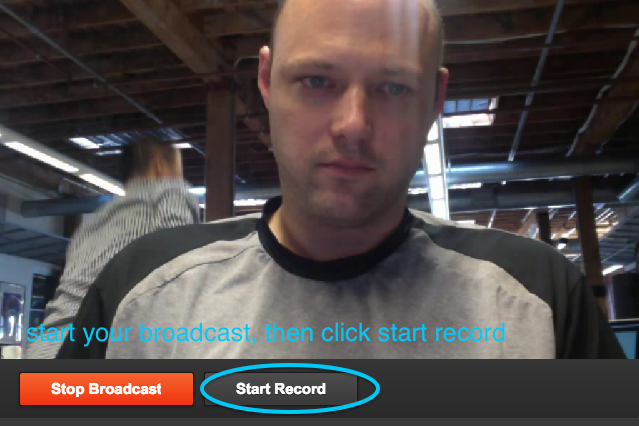 You can also record broadcasts that you do with Producer to your channel. Open Producer, and log in using your credentials. You will be directed next to a pop up window where you can choose what channel you want to broadcast to, what resolution you wish to broadcast at, and whether or not you wish to record your broadcast onto the IBM Watson Media Dashboard. NOTE:Broadcasts recorded in this manner will be limited to 3 hours. Unlike broadcasting from the web broadcaster or the remote console, a new recording will not automatically begin after the 3 hour mark. If you plan on recording more than 3 hours, use the remote record console instead. The file encoding dropdown menu shown refers to what resolution a local copy of a broadcast will be made at. Producer allows you to record a copy of your broadcast to your local drive- this is done through the Record button on the Producer interface. Recording a local copy at a different resolution than your broadcast can be useful if you can only broadcast at a low resolution due to bandwidth limitations, but would like a higher quality recording to be available to you. To record on the app, simply begin your broadcast. When you stop broadcasting, you will automatically be prompted to title your broadcast. Be sure to hit 'Save' after doing so. log in to your account and go to Channel Settings in your dropdown menu. 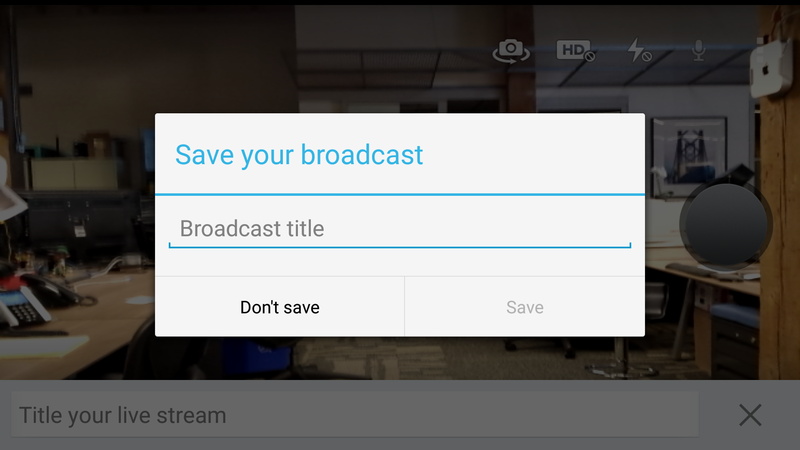 Select the name of the channel you wish to set automatic recording for, and go to the Broadcast settings tab. Click on Settings to the right of the Auto-recording option. 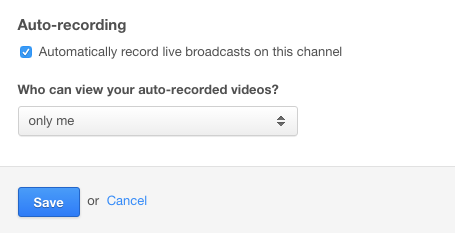 To set autorecording for the channel, simply check the box. You can also set whether or not your autorecordings will be publicly available or private by default by accessing the dropdown menu in this tab. Please note- automatic recordings are only saved by default on your channel for 30 days. You will need to manually save the autorecordings in your video management tab in order to preserve them.